The builder deck is good enough when you are building your home and want to save what extra money you have for upgrades to your kitchen appliances, hardwood floors or a jet tub for the master bath. It also works just fine when you are “trading up” to get a little more room and it’s the deck that comes with the house in the neighborhood with the great schools. But the time will come when you are ready to make a change. People often hesitate to completely tear out a serviceable deck. They worry that it is wasteful, so we often hear the question, “Can we make our deck bigger?” My answer: absolutely. 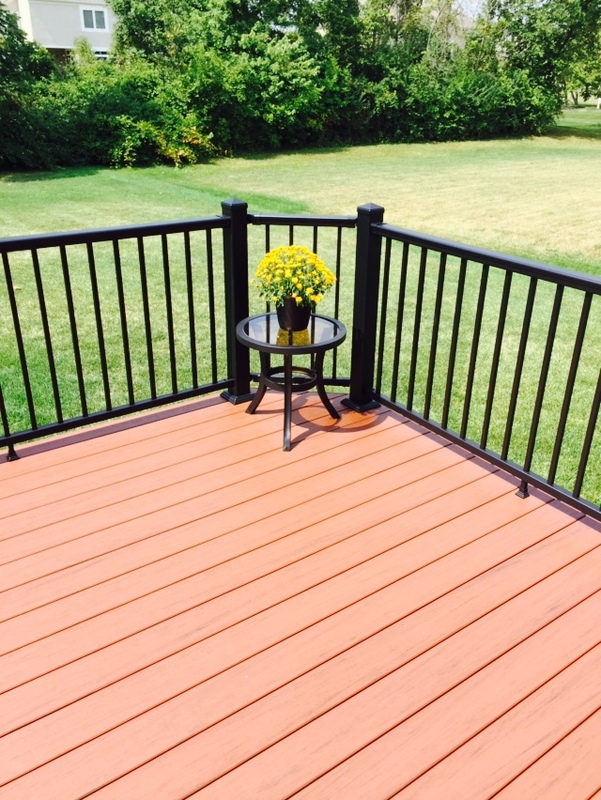 Here is a typical example of a Columbus deck upgrade/expansion project that we completed. We took what they had and improved upon it. Composite and synthetic woods have come a long way baby. Look at the stunning color of this deck. 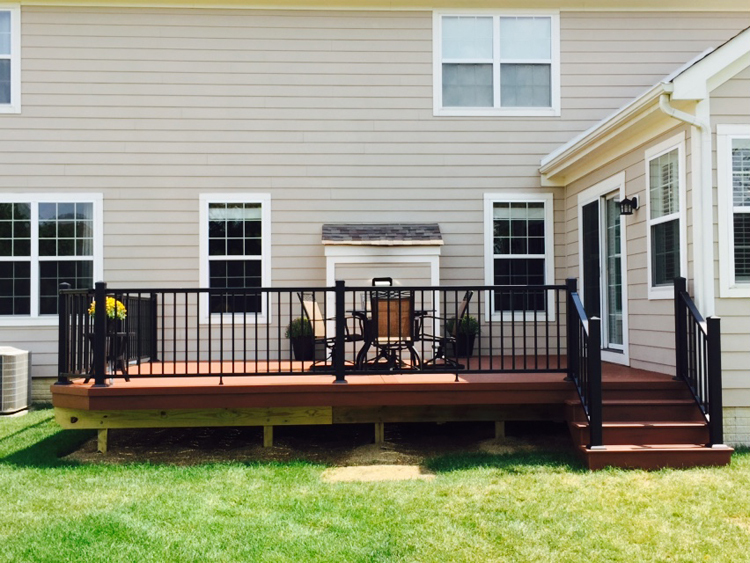 Our Powell OH customers had the same petite builder deck as several other homes in the neighborhood. It was constructed of pressure-treated pine and was too small to be of real use. Archadeck removed the decking and railing, leaving the underlying structure in place. We extended the base to make it 6-8 feet wider. Then we replaced the tired, faded wood boards with TimberTech Evolutions Pacific Redwood; it harmonizes with the floors inside the house. That change alone makes a tremendous difference both aesthetically and from a home maintenance perspective. Next we added some small details that you just don’t see on builder decks. They aren’t necessarily expensive to do, but they have a big visual impact. We used a double parting board down the middle which gives a pleasing visual division of space and serves the practical purpose, allowing that extended width along the back of the house. We also created a small, attractive bay area at the corner– that’s something you just don’t see on a cookie-cutter builder deck. We widened the stairs the yard just a bit. Obviously, that makes it a little more comfortable for moving back and forth, but it also creates a better sense of balance to have a larger staircase with the larger deck. The stairs and the perimeter are adorned with a contemporary black aluminum rail. It’s sleek and functional at the same time. I’m pretty good with dogs, but if you were going to give me a nickname, it would more likely be “the house whisperer.” I listen closely to what my clients tell me about their vision for their outdoor living project, but I get a huge amount of the information I need to do my job right by a careful site survey–essentially listening to what the home and site tell me. Obviously, homes don’t talk to you, but they do have individual characteristics and they all interact differently with the environment. While I’m walking around the yard with a homeowner, I’ll look places they might not expect, ask questions that they think are nuts and will take notes. It’s all part of the process of determining what is possible and what is best for a particular job. I start by looking at site conditions. What is the architecture, size, and age of the home? Where are the vents, windows, and doors? What kind of siding and roof are on the existing home? And, probably most important of all: where is the water going to go? Not the water pipes, but the rain and snow melt. Take a look at this home before and after the new porch. There were multiple roof lines and the center portion had a high window that provided a challenge for adding a roof. This elevated roof porch overcame all the architectural solutions while creating a fabulous solution. If you are building a Columbus screened porch, I will determine if a gable or hip roof is possible. Many people prefer gable roofs because they are so light and airy, but sometimes the location of a window or door will dictate a shed roof. The grade of the land will tell me whether we need to discuss a railing. Code states that any structure 30” or higher off the ground needs rails for safety. In addition to design considerations, I’ll be thinking about some work site issues for my crew. Do they need to take down a fence to bring in large equipment? Is there space to stage lumber or materials on the site? How long will the commute be? Are there neighbors we don’t want to wake up early in the morning? Some of these issues impact the cost of labor and ultimately the price I will quote the clients. If a company is quoting you a flat price per square foot to do a job, they aren’t giving you an accurate bid, they are taking a shot in the dark. Take a look at the incredibly steep grade in this yard. Integrating with this steep drop off was one challenge. We also needed to follow the design lead of the Frank Lloyd Wright architecture. The spiral stairs provided a great way to bridge the second story porch and the steep grade. A comprehensive site survey also allows me to collect the information and photos that I will use to create architectural designs and plans. So the short answer is: I’m in your yard getting your project started on the right foot. I love a good, long, hard, drenching rainstorm. Not all the time naturally, but there is something incredibly invigorating about watching Mother Nature flex her muscles and bring some serious water down from above. The key, of course, is having someplace where you can watch such a magnificent display from under cover. We recently build a wonderful space for just this purpose in Pataskala. The homeowners had parts of their outdoor living space that they liked, but there were others that just didn’t work for them. They called Archadeck of Columbus because they were ready to make a change and wanted an update that would give them plenty of space for relaxed entertaining or tailgating on some days, and a place to take in a wild rainstorm on others. The first part of the job was to remove an outdated concrete slab and the lower level of a two-level deck. We replaced both of these areas with a custom Unilock stone patio. While it’s effectively one large area, we differentiated the patio into three discrete spaces by using different color stones, using multiple course designs in the layout, adding some seating walls & pillars, and covering nearly half of it with an open-air porch. The customer liked the rustic, natural look of Unilock pavers. They have a subtly distressed appearance when they come from the factory, so they look like they have always been part of the home–making the area feel both classic and relaxed. We built the floor of the patio with Unilock Avante Ashlar, using a combination of Sierra and Sandstone colors for the center and contrasting border. It looks very sharp. We constructed the seating walls and pillars with the complementary line of Unilock Brussels which is a distinctive and beautiful paver. The open area provides ample space for relaxing under the stars or gathering around the fire pit. We replaced a retractable awning with a permanent covered patio that gives the customers the option to enjoy their yard in all kinds of weather. Each pillar has an outlet to plug in radios, phones or anything else at hand. We also installed permanent wiring for an outdoor TV, a ceiling fan on the ridge beam and outlets earmarked for party lights. There is a narrow, sunny area just in front of the porch that is perfect for catching some rays while relaxing on a chaise. In addition to the design details that make the project easy to use and great to look at, there are other, less evident structural details that will make a huge difference to the owners over time. The large width of the porch demanded extra roof support. To avoid blocking light to the upstairs window, we built a low-pitched roof. We’ve found that low-pitched Columbus porch roofs need to have an ice and water guard or the homeowners will have big trouble down the road. You might notice the millwork and wrapped posts on the porch. It’s important to always have a seasoned builder evaluate your desired projects, looking at both structure and design details. 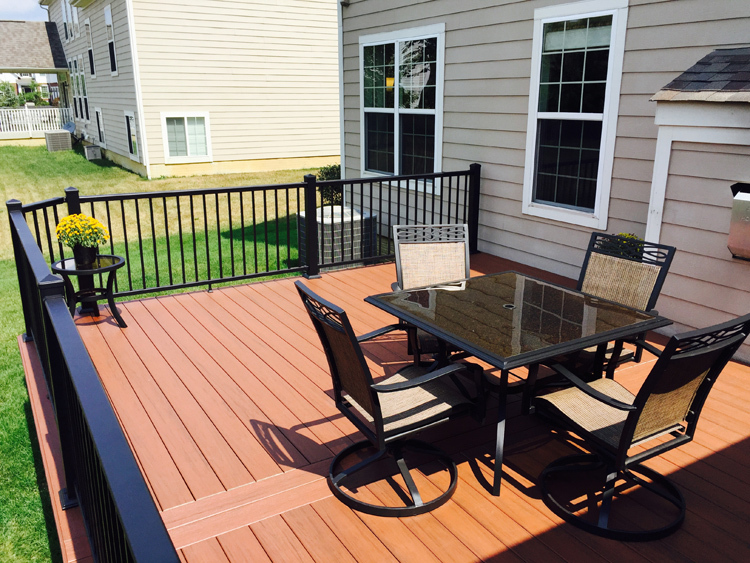 “Let me start off by saying we absolutely love the patio and the work done by Archadeck. From the beginning design phase to final completion everyone that represented the company were top notch. Rob with our design, Phil as his back up , Seth on construction to Paco on the pavers all of them went out of their to make sure the job was done to our satisfaction. As with many construction projects we had some glitches along the way but in the end I felt any issues were handled fairly and reasonably. I felt I was always able to get ahold of Rob at anytime day or night with my issues and he responded promptly to all inquiries. Seth and the carpentry work he preformed is beautiful. Paco and his crew did a beautiful job with the pavers. My wife and I keep saying “it feels like we moved” because the space they created for us makes it feel like a completely different house. I think most peoples frustrations with contractors is that once they have your money your stuck. Sometimes they show up and sometimes they don’t , with no explanation. Not Archadeck, we were always kept informed as to who and when someone would be there and what they would be doing that day. And they were always there when they said they would be. If no one was working that day, you knew why and when they would be back. This was a big job and when any of the crew were there they were working and getting alot done. The job site was cleaned up every night and the space around the work area was usable. Finally the bill, there were addendums that were added only they way from the initial quote. They were very specific as to the changes and the cost. When the job was over, we paid what we owed with no “surprises”. No job this big gets done without some issues but I feel they were all professionally handled. And they fact that they operate as a single point of contact using all their own subs and employees I didn’t have to make sure there was coordination between some outside contractor and Archadeck,. The one outside contractor I did have to bring in was told when he would be able to do his part and they were respectful of his time and he was able to do his work when he was told. If you’re thinking about adding an outdoor living space to your Columbus backyard, contact us to see how we can make creating your dream backyard an enjoyable experience, start to finish. The consultation is completely free. Call (740) 879 – 3730 or email us at westcolumbus@archadeck.net. We look forward to your call.